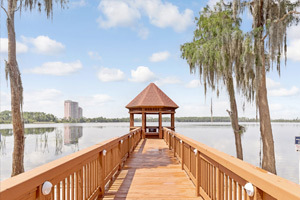 When you stay at Hyatt Place Orlando/Lake Buena Vista in Orlando, you'll be in a shopping district, a 4-minute drive from Walt Disney World® area and 7 minutes from Disney Springs®. This hotel is 1.8 mi (2.9 km) from Walt Disney World® Resort and 2.3 mi (3.6 km) from Disney's Typhoon Lagoon Water Park. Make yourself at home in one of the 169 air-conditioned rooms featuring refrigerators and flat-screen televisions. Your bed comes with premium bedding, and all rooms are furnished with double sofa beds. Complimentary wireless Internet access is available to keep you connected. Private bathrooms with shower/tub combinations feature designer toiletries and hair dryers. Enjoy a range of recreational amenities, including an outdoor pool, a spa tub, and a fitness center. Additional amenities at this hotel include complimentary wireless Internet access, concierge services, and wedding services. Spending a day of fun is easy with the complimentary theme park shuttle. Satisfy your appetite at the hotel's coffee shop/café. Quench your thirst with your favorite drink at the bar/lounge. Full breakfasts are available daily from 6:30 AM to 10:00 AM for a fee. The preferred airport for Hyatt Place Orlando/Lake Buena Vista is Orlando, FL (MCO-Orlando Intl. ).